The back story for upcoming reviews on Mallard Creek Muck Buster, Kensington Blankets, Horseware Blankets, Keratex Hoof Hardener, Keratex Hoof Gel, and Horse Guard Trifecta. A constant complaint I have with Southern California is that initial settlers irresponsibly irrigated a desert, not thinking of water issues: lack of fresh water and water in the form of weather. Naturally, this complaint arrises every time it rains because people didn’t build homes or barns to logically withstand a true rain fall. So, for the past two years I have been struggling immensely with the balancing act that is preventing and dealing with flooding. Most recently, I have been struggling with Norman’s living situation. He is a very kind horse that has gone though a tremendous amount in his life. This has left him very wary of just about everything new, especially enclosed spaces. Recently, he has proven to me that he is far more trusting, curious, and confident that he was a year and half ago, when he came home to HNH. However, he still does not enjoy being stalled and I do not have the ability to remove extra stimulus to aid his desensitization to this phobia. For the dry season in 2018, Norman has been living the good life in the arena; sunbathing, rolling, and being a horse while fully recovering from his lameness and emotional scaring. But, the rain is really trying on his newly revived hooves. So, I went on a mission to give him a dry spot to hang out in, not that he uses it, but it is the thought that counts, right? We started with adding a pop up canopy and mats to the arena. The pop up was quick and easy to assemble as well as a breeze to tie down on the fencing. The mats provided a clean space for food as well as a drier spot for his feet. In the light rain, the tent did really well, but the arena didn’t handle this latest storm well. So, as things dried out for the next couple of weeks, we held off putting anything new up until we could get the areas walkable. Next, we tried a tarp, aka the fort. This method was a grown up version of our nine-year-old fort building style. 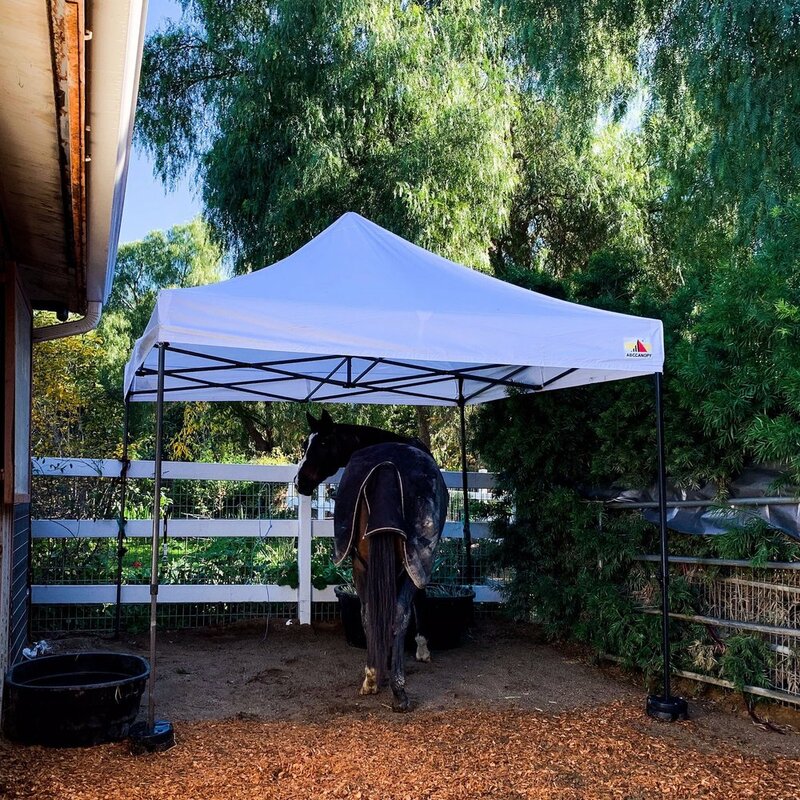 Basically, we were trying to live vicariously through our nine-year-old OTTB by giving him a fort to play and live in. And it would have worked had we gotten the poles in time to get the left side pinned up. Instead, it came crashing down into the back of the stall runs. Needless to say, after hours of work, we were a little more than heart broken. It was not supposed to rain that much in two hours. Luckily, I followed my instincts and didn’t put the horses in the back to test anything out. No harm, no fowl, just a big mess to clean up. The next day I spent six grueling hours pulling out tarps, digging trenches, shoveling mud, and grating the ground in an attempt to get it to slope away from the barn. It worked really well for the next little bit of rain that popped up unexpectedly, but we sill had issue with over-saturation because of previous rains and the girls’s pee spots. So, we added some wood chips and Norman’s tent to the mix. We used Muck Buster by Mallard Creek. It is not ideal because I thought we were getting four cubic feet bags, not two. This has left the foundation a little thin, but he feels safe. And there should be a fair amount of sunshine and warmth to help dry up a bit more. If I can figure out a bit more money (it was pricy setting him up) I will get a few more bags to help mange the sloshier spots. Wood chips work as an absorbing tool as well as a barrier between mud. When installed correctly, it is rather impressive! It will also aid in the mud drying faster because wood chips heat up quicker than the surrounding sand/dirt combo. Norman is so happy thus far in the back of the stalls. He gets to see Lila and enjoy the little paddock we made for him. Here is to hoping that the next five days of rain will hold up for him! Running your own space, one that doesn’t have a maintenance crew or barn hand is sometimes quite the challenge. Especially when you’re publicly known as the barn that floods the worst in the neighborhood. But that’s life, when it rains it pours. There are always solutions though, some better than others. Even when it is tough, there is always another thing to try. And even if you fail, at least the sun aways comes out eventually. Thats the good thing about effort. And the same principle applies to anything horse related. Norman is a constant learning curve for me; how to keep him happy, calm, and healthy. And I will never stop fighting to do just that for him. His horse deserves the world, and one day, HNH will be able to do that for him.